Great book event “in conversation with” my brother…and a rare chance for me to hang out on his turf and talk about books, writing, family and food. That’s Adrian and me fielding questions after the reading, Patagonia Upper West Side, New York City. Huge thanks to Adrian for thoughtful questions and an amazing food tour of NY (more on that later), to my sister-in-law Sarah for putting together a fantastic post-event party, and to the crew at Patagonia UWS for a fun event. Also to our mom for making the trek, the Brennan family for being there, and to good friend Smarty, for a surprise appearance in the Big City. A night to remember for sure. Puget Sound friends! I will be talking about foraging, fishing, writing, kids in the outdoors and conservation with my good friend, author Bruce Barcott, on Tuesday, April 12th at the Seattle Patagonia store. At some point, I will read a few stories from Closer to the Ground as well. Doors open at 7:00pm, talk and reading starts at 7:30. If nothing else, come for the snacks from Patagonia Provisions and beer. The real treat of the evening, though, is the opportunity to meet Bruce. He’s an incredible writer and thinker, and the author of some of my favorite books: The Measure of a Mountain, The Last Flight of the Scarlet Macaw, and most recently, Weed the People. And since he’s going to be asking the questions, I guess I’m not really sure what exactly we’ll be talking about. But knowing Bruce, I’m sure it will be interesting. I’m stoked for the event and looking forward to meeting everyone. Come on down if you can. Hope you are all well. Just a quick reminder about upcoming book tour events. I will be at the Portland Patagonia store Wednesday, March 9th, “in conversation with” my good friend, novelist John Larison. Doors open at 7:00pm, and we’ll start talking about Closer to the Ground, kids, foraging and food at 7:45. At some point, I will read some stories from the book as well. Snacks from Patagonia Provisions. Join us if you can. And if you don’t know him or his work, Larison is brilliant. He’s the author of Northwest of Normal and Holding Lies, not to mention an incredible new novel (It’s going to be huge!) due out next year. He’s also a hell of a nice guy, an amazing angler, hunter, forager and father, and one of the main forces behind my writing of the book in the first place. His work and life continue to inspire me, and I’m honored to appear with him. I think you’ll really enjoy meeting him. I will post more specifics as the dates come closer, but here are a few more: I will be at Patagonia San Francisco at 7:00pm, March 16th; Patagonia Seattle, 7:00pm April 12th (with yet another great writer and friend, Bruce Barcott, author of The Measure of a Mountain, The Last Flight of the Scarlet Macaw, and most recently, Weed the People); Patagonia Vancouver (BC), 7:00pm April 27th; and Patagonia Upper West Side, New York City, 7:00pm, May 18th (with New Yorker Cover artist, Adrian Tomine, who in addition to being my brother, is the author/illustrator of Summer Blonde, Shortcomings, and the recent and highly acclaimed Killing and Dying). I think these events are going to be a lot of fun. 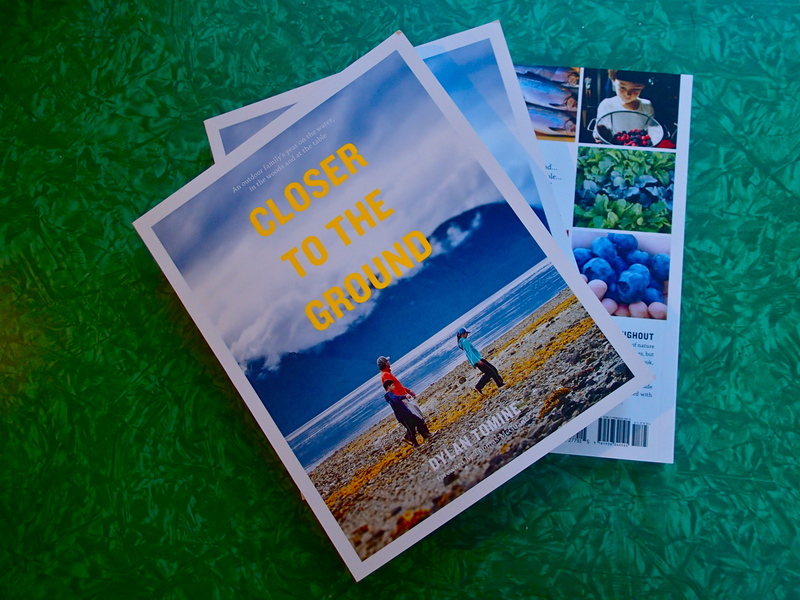 Well, here it is: The new, paperback second edition of Closer to the Ground. This version is completely redesigned, with new cover, lots of photos, recipes, and yes, a lower price. After more hours than I can count spent searching through family photo files, working with the design team, and fixing a few things from the original text, I can hardly believe it’s available–and two weeks ahead of schedule. Amazing. We also made a little book “trailer” video for it, which you can watch HERE. I’m really excited about how both the book and the video turned out. Hope you like ’em. As part of the re-launch for the second edition, Patagonia Books commissioned this little “book trailer.” I’m not really sure what that means or how it works, but I think the idea is that the video helps sell books. In which case, as weird as it is seeing and hearing myself onscreen, I’m all for it. And the kids and I had a fun time with the shoot. Huge thanks to the good folks at Vignette Creative for doing such a beautiful job. I will probably post this again when we’re closer to the release date of the paperback, but thought I’d put up an early peek now. Hope you like it.